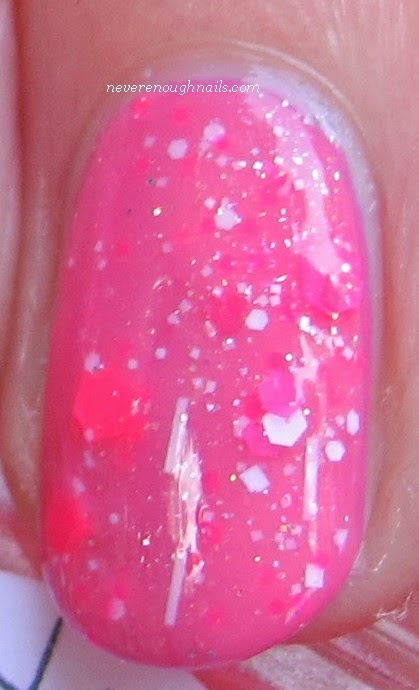 Today I have a really fun glitter polish for you, Lynnderella Kissy Fit. The limited edition Kissy Fit is a mixture of assorted bright neon pink and white glitters in a heavily shimmered translucent milky base. The neon pink and white glitters are so bright and perfect for summer. The shimmer in the base is rainbow-y in person, so it makes this even more special. This is one coat of Kissy Fit over two coats of OPI Suzi Has a Swede Tooth. Kissy Fit applied really well, the glitter was plentiful and I did not have to fish around for any of it. The bar glitters all laid nice and flat too. 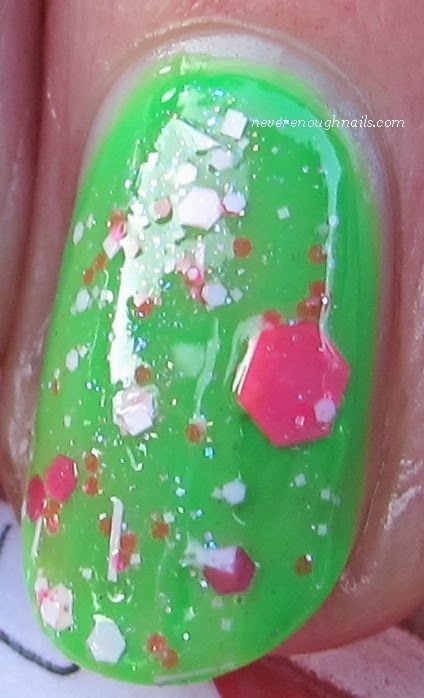 I always like to layer Lynns over unexpected colors, so I thought I'd also try it over China Glaze Kiwi Cool-ada. This combo is really summery, like a Lily Pulitzer print or something! This is one coat of Kissy Fit over three coats of Kiwi Cool-ada. If you're looking for a fun summer glitter topper, I would absolutely recommend Kissy Fit. I want to wear it over neon yellow next! Lynnderella Kissy Fit and other Lynnderella lacquers are available at Lynnderella.com and the Lynnderella Storenvy. For more information and to stay informed about upcoming collections, check out Lynnderella's blog. Don't forget that my Lynnderella giveaway ends tonight at midnight! Enter now! Thanks Ananka! I love thinking of different base colors for Lynns!